This 16th annual review discusses 12 fatal airline crashes and 11 other significant events from 2011, a year with more fatal passenger airline crashes than 2010, but fewer significant events. Unlike last year, which saw no fatal passenger airliner crashes in North America or western Europe, there were two this year. 2011 saw two significant milestones for both aviation safety and aviation security. The security milestone was of course the tenth anniversary of the attacks of 9/11. The past decade has brought on a host of significant changes in attitudes about what is acceptable when it comes to risks, and the steps taken to reduce or eliminate those risks when it comes to sabotage, hijackings, and other intentional threats to the air transportation system. Since 9/11, there have been two bombing attempts, both unsuccessful, involving US airliners, the December 2001 shoe bomber event involving Richard Reid, and the 2009 underwear bomber event involving Umar Farouk Abdulmutallab. The other, less publicized milestone was the tenth anniversary of the last US crash involving a large passenger jet, the November 11, 2001 crash of an American Airlines A300 in New York. In the 10-year span since that A300 crash, there have been five fatal US passenger airliner crashes involving smaller aircraft, four turboprop aircraft, and a regional jet. While there have been no fatal crashes involving large passenger jets in the last 10 years, there have been two fatal crashes involving large US cargo jets, a UPS 747 in Dubai in 2010 and a FedEx MD11 in Japan in 2009. The first fatal crash of a large jet airliner in Canada in almost 13 years. Three fatal crashes with a sole survivor. There were 19 events that involved passenger fatalities and there were no passenger survivors in eight of these events. 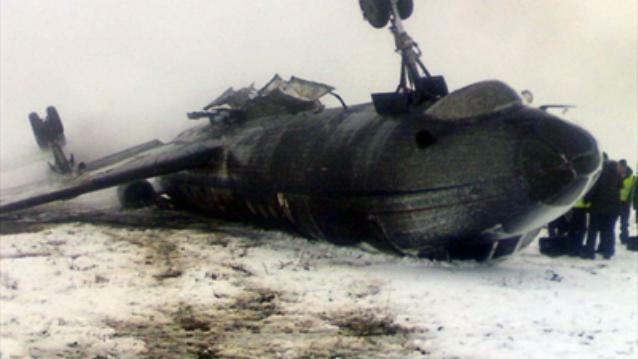 1 January 2011; Kogalymavia (also known as Kolavia); Tu154M; RA-85588; flight 348; Surgut, Russia: The aircraft was on a scheduled domestic flight from Surgut to Moscow, Russia. The aircraft caught fire while the aircraft was taxiing toward the runway. All eight crew members survived, and three of the 126 passengers were killed. The aircraft was on a scheduled domestic flight from Tehran to Urmia, Iran when it crashed near the destination airport. Ten of the 11 crew members and 67 of the 94 passengers were killed. The aircraft was on a scheduled international flight from Belfast, Northern Ireland to Cork, Ireland when it crashed near the destination airport. There were low visibility conditions at the time of the crash. On the crew's third landing attempt, the aircraft crashed adjacent to a taxiway, came to rest upside down, and caught fire. Both crew members and four of the ten passengers were killed. 18 May 2011; Sol Líneas Aéreas Saab 340A; LV-CEJ; Flight 5428; near Prahuaniyeu, Argentina: The aircraft was on a scheduled domestic flight from Neuquén near the Andes to Comodoro Rivadavia, Argentina when it crashed about 25 kilometers (15 miles) southwest of the town of Los Menucos. The last contact with the aircraft occurred about 40 minutes after taking off from Neuquén. All three crew members and 19 passengers, including one child, were killed. 20 June 2011; RusAir; Tu134A; RA-65691; flight 7R-243; Petrozavodsk, Russia: The aircraft was on a domestic flight from Moscow (Domodedovo)to Petrozavodsk, Russia. The aircraft crashed on a roadway about one kilometer from the destination airport. Eight of the nine crew members and 39 of the 43 passengers were killed. The aircraft was on a scheduled domestic flight from Kinshasa to Kisangani, DR Congo when it crashed after missing the runway during a landing attempt. The aircraft came to rest about 300 meters from the runway. At the time, there was heavy rain, limited visibility, and thunderstorms in the area. According to a report about the crash in the Aviation Herald, the runway had no published instrument landing procedures. The aircraft was destroyed in the crash. Five of the seven crew members, and 72 of the 108 passengers were killed. 20 August 2011; First Air; 737-200; flight 6560; Resolute Bay, Canada: The aircraft (C-GNWN) was on a chartered domestic Canadian flight from Yellowknife in the Northwest Territories to to Resolute Bay in Nunavut Territory. The aircraft crashed near the runway during a landing attempt and broke up. All four crew members and eight of the 11 passengers were killed. Among the three survivors was a seven-year-old girl. However, her six-year-old sister was killed in the crash. Prior to this fatal crash, the airline had two prior serious, though nonfatal, incidents involving of their 737 fleet. In 2001, a First Air 737 landed short of the runway Yellowknife and was seriously damaged. While the aircraft was too damaged to be repaired, none of the 98 passengers or six crew members were injured. In a 2004 landing incident in Edmonton, Alberta, the aircraft landed to the side of the runway and struck a number of lights and a sign before the crew was able to come to a stop on the runway. This aircraft returned to service, and was the same one involved in the fatal Resolute Bay crash. 7 September 2011; Yak Service Yak-42D; RA-42434; Yaroslavl, Russia: The aircraft was on a nonscheduled international flight from Yaroslavl, Russia to Minsk, Belarus when it crashed shortly after taking off from Yaroslavl Airport. The aircraft apparently ran off the runway took off several hundred meters beyond the end of the runway. After lifting off, the aircraft struck a radio mast about 450 meters from the end of the runway, and crashed at the edge of the Volga River. Seven of the eight crew members, and all 37 passengers were killed. Among the passengers were the coaching staff and players of the Lokomotiv Yaroslavl professional hockey team. The team included several former NHL players as well as several members of the Russian national hockey team. This was the 23rd sole survivor airline crash since 1970, three of which occurred in 2011. 20 September 2011; SALSA d'Haiti (Services Aeriens Latinosamericains, S.A. d'Haiti); Beech 99A; HH-APA; ;flight 112; Lorie, Haiti: The aircraft was on a scheduled domestic flight from Port-au-Prince to Cap Haitien, Haiti, and crashed in a field near Lorie, Haiti, There was heavy rain in the area at the time of the crash. Both crew members and the single passenger were killed. The aircraft was on a scheduled domestic sightseeing flight which was to start and end at Kathmandu, Nepal. The aircraft crashed during approach at the end of the flight and the crash location was several miles short of the runway. All three crew members and 16 passengers were killed. 13 October 2011; Airlines PNG Dash 8; P2-MCJ; Flight 1600; near Madang, Papua New Guinea: The aircraft was on a scheduled domestic flight from Lae to Madang, Papua New Guinea, and crashed into a dense forest about 20 km south of Madang while on approach. All three crew members survived but 28 of the 29 passengers were killed. This is the second fatal passenger flight involving this airline. On 11 August 2009, both crew members and all 11 passengers were killed in the when a Twin Otter Airlines PNG aircraft crashed into a mountain near Kokoda Airport. The following events included several that killed passengers, but did not could in the previous list either because they involved aircraft that are not used in airline service in North America or western Europe or because they did not fit other AirSafe.com requirements for inclusion in the fatal airline events list. Other crashes that did not involve airline aircraft were included because they were noteworthy in other ways. 14 February 2011; Central American Airways; Let 410; HR-AUQ; near Cerro de Hula, Honduras: The aircraft was on a domestic flight from San Pedro Sula to Tegucigalpa, Honduras, and crashed into a forest while en route to its destination. Both crew members and all 12 passengers were killed. 1 April 2011; Southwest Airlines 737-300; flight 812; near Yuma, AZ: The airline was on a scheduled flight from Phoenix, AZ to Sacramento, CA, when it experienced a rapid loss of cabin pressure after a rupture developed in the upper fuselage about 18 minutes after takeoff when the aircraft was climbing through 34,000 feet. After the loss of cabin pressure, the crew was able to divert to Yuma, AZ without further incident. There were no serious injuries among the 117 passengers and five crew members on board. The rupture was about five feet long and about a foot wide. The NTSB launched a major investigation of this event, and additional details about this investigation are available at AirSafeNews.com. Because no passengers were killed, this event was not counted as a fatal event as defined by AirSafe.com. 4 April 2011; Georgian Airways Canadair CRJ-100; 4L-GAE; flight 834; Kinshasa, Democratic Republic of Congo (DNC): The aircraft was on a domestic unscheduled flight from Kisangani to N'Djili airport in Kinshasa, and was attempting an instrument approach to runway 24 around 14:00L during heavy rain and under low visibility conditions. The aircraft missed the runway, broke up, and caught fire. , and crashed into a forest while en route to its destination. All four crew members and 28 of the 29 passengers were killed. 7 May 2011; Merpati Nusantara Airlines Xian MA60; PK-MZK; near Kaimana, Indonesia: The aircraft was on a domestic scheduled flight from Sorong to Kaimana, Indonesia, and crashed into the sea about 600 meters short of the runway. The aircraft broke up and sank, and all 19 passengers and six crew members were killed. 11 July 2011; Angara Airlines Antonov 24RV; RA-47302; flight 5007; near Strezhevoy, Russia: The aircraft was on a scheduled domestic flight from Tomsk to Surgut, Russia, and the crew executed an emergency landing in the Ob River near the town of Strezhevoy, Russia. The crew reported an engine fire while en route, about 90 minutes after takeoff. All four crew members survived, but six of the 33 passengers were killed. 13 July 2011; NOAR Linhas Aéreas; Let 410; PR-NOB; ;flight NRA-4896; Recife, Brazil: The aircraft was on a domestic flight from Recife to Natal, Brazil, and crashed in a populated area about one minute after takeoff, narrowly missing several buildings. The aircraft was destroyed by the impact and post crash fire. Both crew members and all 14 passengers were killed. 28 July 2011; Asiana Airlines; 747-400F; HL7604; flight 991; near Jeju, South Korea: The aircraft was on an international cargo flight from Seoul, South Korea, to Shanghai, China. About an hour after takeoff, the crew reported on onboard fire and diverted toward Jeju, South Korea. Both pilots were killed in the crash. 29 September 2011; Nusantara Buana Air CASA-212; PK-TLF; near Bohorok, Indonesia: The aircraft was on a scheduled domestic flight from Medan to Kutacane, Indonesia. Contact was lost with the aircraft a few minutes after departure, and had crashed into a forest while en route. All four crew members and 14 passengers were killed. 1 November 2011; LOT 767-300; SP-LPC; flight 16; Warsaw, Poland: The aircraft was on scheduled international flight from Newark, NJ to Warsaw, a flight that was uneventful until shortly before landing when the crew was unable to lower the landing gear. The crew continued to fly and burn off fuel for about 90 minutes, giving emergency crews time to foam the runway, and allowing the authorities to dispatch a pair of F-16s to inspect the LOT aircraft. The crew executed a successful gear up landing that resulted in no injuries among the 220 passengers and 11 crew members. 17 November 2011; Piper Cherokee; N7746W; near Perryville, AR: Oklahoma State University (OSU) women's basketball coach Kurt Budke, assistant women's basketball coach Miranda Serna, the pilot, and one other passenger were killed in a crash that took place about 40 miles northwest of Little Rock, AR. The coaches were heading to Little Rock on a recruiting trip at the time of the crash. While the aircraft was privately owned, the plane's pilot was a certified commercial pilot. Early reports indicate that the pilot, a former Oklahoma state senator, was an OSU alumnus and donor, but had not previously flown OSU coaches prior to the accident flight. This is not the first fatal crash involving OSU athletics. On 27 January 2001, two OSU basketball players, an OSU basketball executive and five staffers and broadcasters associated with the program were killed when their ; Beechcraft King Air crashed shortly after takeoff from the Jefferson County airport near Denver, CO. The two crew members were also killed. The chartered aircraft was bound for Stillwater, Oklahoma when it took off during snowy conditions. After the 2001 crash, OSU changed their travel policies for student athletes, including rules requiring two pilots to be on board for all OSU travel involving student athletes and aircraft to be powered by two or more turbine engines. However, these policy changes did not apply to recruiting trips involving only coaches. Be sure to check out the latest free downloads from AirSafe.com, including the new book, AirSafe.com Baggage and Security Guide, the newly revised Parenting and the Internet, and The AirSafe.com Podcasting Manual. These books are available as PDF files, MOBI files for your Kindle, or EPUB files for your iPad. Thanks for the important information.All airlines emploies - specially crew members- can learn much more about security and safety. But - and there's allawys a but...- with comercial targets airlines forget about!